A book proposal without a marketing section is like a cup of coffee without sugar. The marketing section is the sweetener for your book description, and it does more than satisfy a publisher’s desire to make money. It shows your literary agent and acquiring editor, and most importantly the publisher’s in-house marketing team, that your book will sell. Second, remember to include the most important markets first. Don’t be shy about saying that millions of readers will be interested in your title. This is precisely what a publisher wants to hear. So say it if you think it’s true. Third, don’t forget your minor markets. If you’re writing a book about World War Two, mention that libraries will want the book. Also state that veterans will be interested in the title. You could also say that some women will be interested in it, especially those who are married to veterans or those who teach history. Although your minor markets will not sell as big as your major markets, don’t forget to include them because every sale counts, and publishers may have ways of marketing to these special groups. A description of your major markets. This could run from one to two or more paragraphs. An enumeration of your minor markets. This could fit into one or more paragraphs, depending on how many minor markets you can identify. 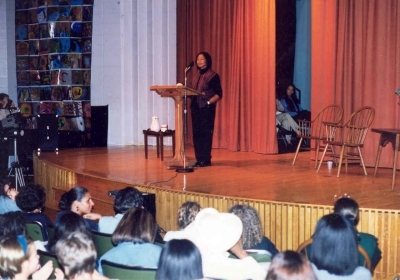 Alice Walker is pictured above speaking to a group of young women. If you can imagine speaking to an audience about your book and if you can describe that hypothetical audience, then you've just identified a potential market for your book. List it in your book proposal. Next we'll look at the promotion section of the book proposal.